A council which rejected a regional daily’s Freedom of Information request has performed a U-turn after an appeal by the newspaper. 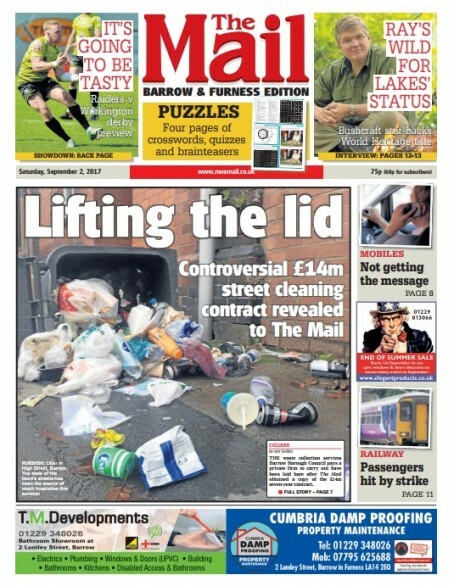 Barrow Borough Council had refused to give The Mail, formerly the North West Evening Mail, details of a street cleaning and waste collection contract it awarded in April to a new firm, which readers had blamed for an increase in litter and reduced services in the town. The seven-year £14m contract had been given to FCC Environment, but the authority declined to make the terms of the contract public on the grounds that it contained commercially sensitive information. But Mail breaking news reporter Amy Fenton, who submitted the request, appealed to the authority directly over the decision, citing guidance by the Information Commissioner’s Office about when an authority can use the exemption of commercially confidential information. As a result, the council backed down and the released documents revealed FCC had been contracted to carry out significantly reduced levels of service compared to previous firms working on the authority’s behalf. The successful appeal provided a splash for the Mail last weekend. Amy told HTFP: “Barrow Council’s street cleaning and waste collection contract was awarded to a new firm in April and residents have been blaming the new contractor for an increase in litter and reduced services. “This is an issue which has been causing massive frustration for residents across our area for months and any stories about fly-tipping, litter or weeds blighting pavements are consistently some of our most-read online content. The £2m a year being paid to FCC by the council was around half that being given to previous provider Biffa. Amy added: “When my request was refused I wasn’t at all surprised but I went away and did some research based on the Information Commissioner’s Office guidance about when an authority can use the exemption of commercially confidential information. “The main consideration has to be balancing this with the public interest and in this case, the public interest in this issue locally was overwhelming. “I pointed out that the ICO also advised authorities to promote transparency, competition and accountability for the spending of public money when considering releasing commercially sensitive information. Bravo, Amy Fenton. Diligent work and excellent reporting.